If one cinematic trend defines the 1970s, it’s not the summer blockbuster (Star Wars, Jaws), the “New Hollywood” grit (Mean Streets, Taxi Driver) or even grindhouse exploitation. It’s the car chase movie. And the undisputed king is H.B. 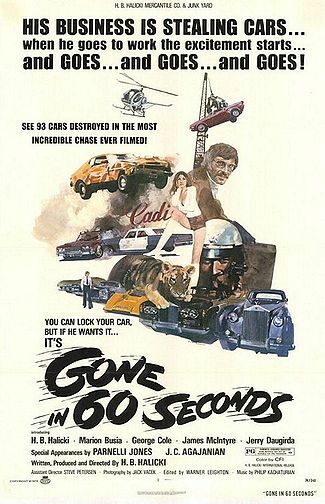 Halicki’s 1974 film, Gone in 60 Seconds. To make an independent movie in the 70s was a sign of drive and willpower far beyond those of independent filmmakers today. Indie directors didn’t want to make navel-gazing talkfests like Juno or Garden State. They strove instead to give the people what they wanted: action, destruction, and anti-establishment heroes who, even when they fail, go out in a blaze of defiant glory. And it took more than a few thousand dollars and a digital camcorder: movies were shot on film and needed both big cameras and the raw stock. Then there was distribution. “Home video” did not exist, so except for television, the only market was theatrical. H.B. Halicki was not a filmmaker. He was a raging self-starter who owned his own auto body shop at 17. And he bought cars. Lots of them. In fact, all the cars crashed in the film (93) were personally owned, and in most cases driven to their demise, by Halicki himself. He applied the same resolve to filmmaking, utlimately writing, directing, producing and starring in both this film and its 1982 follow-up, The Junkman. He personally took both the film and the wrecked Mustang known as “Eleanor” (touted as “the only car to ever receive star billing”) to drive-ins across the country–including one patronized by a certain fictional vampire trying to learn his way around 1975 Memphis. In Blood Groove, my vampire Zginski was introduced to the modern automobile via the film Vanishing Point. By the time of my new novel, The Girls with Games of Blood, Zginski has seen Halicki’s film and is ready to find his own Eleanor. You’ll have to read the book to find out how he does it, and what name he chooses. In 1989, Halicki was accidentally killed on the set of Gone in 60 Seconds II. The footage he’d already shot showed he most definitely hadn’t lost his touch. And although the clothes, music and scenery of the original film set it firmly in 1974, the visceral thrill from the 40-minute final chase is timeless. What’s your favorite car chase movie? Leave a comment before midnight on Sunday, June 27 for a chance to win an advance copy of The Girls with Games of Blood (and for one lucky commenter, I’ll throw in a DVD of Bram Stoker’s Dracula)! Definitely "Death Proof:" in the last one-third of the movie, the tables are turned and the victimized girls end up terrorizing the bad guy (played by Kurt Russell). It's a fake grindhouse flick, so it actually features 70s cars and plenty of crashing. I love how insane and vicious the girls get as they mock him mercilessly while smashing him and his car. I loved all the Smoky and the Bandit movies. We used to watch those at the drive-in then try to replicate the maneuvers on the back roads in my boyfriend's old 1972 Pinto. Ahem. I was in a lot of car wrecks back in the late '70's/early '80's . . . I loved the car chase in Return to Witch MOuntain. Saw that with the kids last week. That whole movie is awesome;) the kiddoes really liked it. Hubby and I were shooting each other looks the whole time- "Was that the best they could do?" I don't know about movie car chases, but we watched "Night Rider" and "Dukes of Hazzard" when I was a kid and loved those. Although Death Proof is high on my list, I might have to lean towards Death Race. There is something a bit "car wars" about it that just gets the blood pumping. The Blues Brothers has the best chase scene, hands-down, and also introduces the public to the new techonolgy cops could start using in the 70's to check liscense plates. A true turning point in car chase scenes. I'd have to say my favorite chase is from the Italian Job where they all bust out of the parking lot in a colorful array of mini coopers.